First, I’m thinking it may be useful for recently converted traditional film users to have the occasional equipment review to help them make one of the most important decisions on equipping their darkrooms. Having said that, what can more one say about an enlarger that’s basically a pleasure to use, looks great and has no vices. In more than a few words… plenty! Although there are a couple of minor niggles, the only immediate problem you could have with this enlarger is how to lift and fit the boxes into your vehicle (or truck) after you’ve bought one. Large the LPL 7452 certainly is… laborious to use it certainly isn’t. This beast is one of the nicest enlargers I’ve ever used mainly because of two features… (a) it has a perfectly counter-balanced head which can be raised or lowered with the touch of your little finger, and (b) the fine-focus control with its 5-to-1 gearing is low enough to tweak the magnified image of grain in and out of focus a couple of times before settling on the precise focus setting. 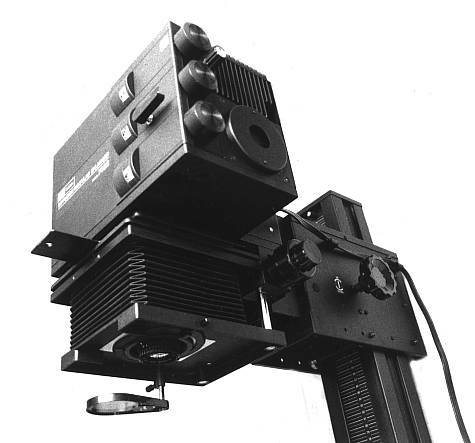 Although earlier models of LPL’s 5×4 enlarger shared a column design and size with the smaller 7700 series (which says much for the 7700’s rigidity) the later 7451 and current 7452 models (also previously marketed as the Saunders 4500 in the USA) have a considerably stronger support with a 90x110mm extruded aluminum column bolted to a steel channel reinforced 25mm (1 inch) thick baseboard. Whilst the baseboard has ample dimensions at 600x600mm (2×2 feet) it has to be positioned 60mm from a wall in order to allow free movement of the head. This may cause problems in darkrooms which have standard 600mm deep worktops, as I had during the review period, because the enlarger’s two front shock-absorbent feet are positioned too far forward… although a pre-assembly tweak with a drill and screwdriver could reposition them to your own needs. An alternative to this (and you would need a very solid, vibration-free darkroom wall) would be to use the proper wall-mounting brackets. The stove enameled matt-black enlarger head and its carriage are fabricated from cast aluminum and sheet steel. Like many enlargers nowadays the 7452 is “modular” and can be adapted to other uses and formats with accessories. You simply purchase what you need initially and add further bits and pieces as required later. Although the two previous models were available as plain “black-and-white” enlargers the 7452 was only supplied (in Europe, as far as I knew) with a Color or Variable Contrast module. But even if you are primarily a monochrome worker it is probably a good idea to purchase the Color version… so utilising the yellow and magenta filters for your multigrade monochrome printing. If you know that you will never want to do color printing then the VCCE (Variable Contrast Constant Exposure) module is not only the cheaper option but the more user-friendly of the two. The VCCE’s built-in filters are calibrated for both Ilford Multigrade and Kodak Polycontrast enlarging papers so that prints can be made at any grade without having to recalculate basic exposure times (although recalculation does have to be made when using the hardest grades 4 to 5). A single knob is used to dial-in grades as fine as one quarter or less… exposures being kept constant by a built-in compensating neutral density (N.D.) filter. Any 5 x 4 color enlarger has to have a bright light source and mixing chamber in order to illuminate a large negative area evenly and to make enlarging times reasonably short. The 24v/250w ELC quartz-halogen lamp used here results in 1-stop of extra light output and some extra heat. Although the cooling system has been redesigned on the 7452 (the fan ducting has been modified to improve efficiency and the wiring circuit has been changed so that it is impossible to switch the light source on without the enlarger’s fan being on) there is still a certain amount of heat generated and transmitted. In fact this heat transfer was so noticeable that I took measurements inside the negative stage to compare the rise and fall in temperature over a period of use that would be deemed normal but not excessive. After being switched-on for 30 secs the space where the negative would be had risen by only 0.5 degrees C… but after 5 minutes the temperature had gone up by 40 degrees C… more than enough to “pop” a negative in a glassless carrier. With the fan remaining on, but the enlarger lamp off, the thermometer probe took 20 minutes to return to the ambient temperature of my darkroom. This is perhaps not an unexpected result considering the wattage of the lamp but I think it means that the glass negative carrier should be specified when ordering the basic enlarger. Interestingly, the “popping” problem was encountered only with thin emulsion / base 35mm negatives. Both 120 roll and 5×4 inch sheet films didn’t show any effects of the rise in temperature, no doubt due to their thicker support base. I realize that a 5 minute exposure can’t be considered normal usage but if an accumulation of rapidly made exposures, in a multiple printing situation for example, started to approach 5 minutes I would be concerned about the stability and focus of the negative. Another 7452 modification has positioned the lamphouse unit 63mm further away from the enlarger’s column. When making large 24×16 inch (60×40 cms) prints from full frame 35mm negatives the enlarger’s head was at the top of the 1350mm column but my Beard masking easel, even with its 3 inch wide frame, was still 3 inches away from the column base. Using a 150mm Nikkor enlarging lens with a 5×4 negative for a slightly smaller print size had the same result… a 3 inch stand-off between easel and column. Curiosity aroused. I went from two extremes to an average and fully projected a 6x7cm negative. Ah! The reason for the box-like extension became clear… it allowed a full 29×23 inch (74×58.5 cms which is also an odd size in metric!) enlargement from ideal-format roll-film negatives. Of course the down side to this handy provision is that standard 10×8 prints, which most of us make much of the time, need a 16×12 masking easel (certainly a Beard 2-blade easel which was and probably still is a very popular item) to be positioned about 7 inches away from the column and 6 inches overlapping the front edge of the enlarger’s baseboard. If the 7452’s extension box was an optional extra I could understand its validity… but it came as part of the overall package so I chose to unbolt it… the last thing you want in a “dark” environment are annoying quirks and niggles with basic equipment. In action the 7452 reminded me slightly, and fondly, of a submarine. Schoolboy visits to these warships in Manchester Docks in the late 1950s and early 1960s were always a thrill – the gentle hum of machinery, lights glowing in the dimness, the sight of polished brass, the smell of cleaning rags… and the up-down smoothness of the periscope as well as its range-finder sights focusing. Back in the darkroom this is what the LPL does well. Height elevation and locking is almost “power assisted” in feel whilst the coarse and fine-focus knobs, combined with the bright light from the quartz-halogen lamp, make accurate focus with any negative spot-on. In fact it’s quite easy using a good grain magnifier to focus a negative with the enlarging lens at its optimum setting of 2-stops down… so avoiding the possibility of any potential focus shift when changing to the printing aperture. The color module incorporates stepless Yellow (0-200), Magenta (0-170) and Cyan (0-200) dichroic filters which are adjusted by large control knobs with adjacent dials giving clear back-lit readings. The standard “white light” lever removes the filters from the light path without changing their settings – useful for clearer framing – and a switchable light attenuator is provided to cut the transmitted light by approximately 2-stops in case the image is so clear that exposure times become unmanageably short. The optional Variable Contrast Constant Exposure module can be interchanged with the Color module in seconds. Only one dial and scale is necessary in order to establish paper grades, or even quarters of a grade. The light attenuator also operates with this module and proved to be “in” more than it was “out” during the test period, so bright was the enlarger’s light source! Something I noticed with this equipment (although it was more of a problem with lamps) was the time taken for the quartz-halogen’s light to fully extinguish. Calculating that the afterglow lasted for about 0.25 seconds the peak output would probably not be reached for 0.25 sec either. The effect becomes a problem when, for example, a 10 sec print exposure is judged to be right from the culmination of ten 1 sec test-strip exposures. It will of course be found that the test print will be overexposed because the correct exposure should have been in the region of 8 seconds. All in all the LPL 7452 is one of the best enlargers of its type and one which I would have bought for myself had my darkroom not been fully equipped at the time with a Durst Laborator L1200 Multigraph. At a recommended retail price in the mid- to late 1990s of around £1750 (+VAT) it was not cheap for an amateur… but one would have been able to find much better “street” prices at around 33% discount from professional dealers such as Firstcall Photographic Limited in the UK or from across the pond in America where LPL enlargers were marketed under the “Saunders” brand and where excellent deals at stores such as B&H Photo Video in New York would have reduced the listed figure considerably. It was (and still may be) best to think of the LPL 7452 as a “once-in-a-lifetime” investment rather than a cost because it was both a quality enlarger and a wise purchase. And, make sure you ask a friend to help load and unload it from your vehicle… a large box weighing over 30 kilos is very awkward to handle by yourself! Whilst searching eBay may be your best source for used enlargers and darkroom materials, the LPL Canadian distributors KHB Photografix have good information on LPL 7452 parts and accessories. BTW: The name initials “LPL” stand for “Little Penguin Limited” which was the quaint original name for the company… and their logo was a little penguin. Image & text © 1998 Ed Buziak. Its such as you read my mind! You appear to know so much about this, like you wrote the ebook in it or something. I feel that you just could do with a few p.c. to power the message home a bit, however instead of that, this is magnificent blog. A great read. I will certainly be back. I would love to own one of these or similar. You would think that people would be giving them away with the popularity of digital imaging, but not so. I simply cannot afford even a second-hand 5×4 enlarger. Hi there. Nice reading. I would like to ask one question about power supply. I can´t find that anywhere. Is LPL making only 120V power supply for it? Or I can also use it in Europe – 230V? Are there some things to look after when you buying second hand? – because I have opportunity these days buy one in good price. Many thanks. All the best. Hello Martin… When I did the review of the LPL 5×4 enlarger I was living in the UK, so it MUST have been supplied with a 240 volt power supply/transformer by the distributor. I couldn’t remember who the distributor was, but on re-reading the article it was Firstcall (excellent people to deal with). The only problem I found with this big LPL was the negative carrier getting hot… but that was only after very long exposures. If I decide to get back into darkroom work I will consider either this particular LPL, or another Durst Multigraph… but the latter must be quite rare nowadays.